The Montecristo Ciudad de Música, a new cigar line produced by Crowned Heads in partnership with Altadis U.S.A., is only the latest example among many instances of Crowned Heads invoking its love of music to help market cigars. At this point, it’s hard to think of the Nashville-based boutique outfit without conjuring images of live rock and artists like Led Zeppelin and Kings of Leon. There are four original Jericho Hill vitolas, all inspired by lyrics and music from At Folsom Prison: .44S (5.1 x 44), LBV (6.5 x 46), OBS (4.75 x 52), and Willy Lee (6 x 54). All are made at the My Father Cigars factory in Estelí with a Mexican San Andrés wrapper around Nicaraguan binder and filler tobaccos. The lightly box-pressed Jack Brown vitola (5 x 56) was added in 2015 and carries a suggested retail price of about $10. I smoked a handful in this size for this review. Each had a reddish, rustic wrapper with thin veins, plenty of wrinkles, and ample tooth. The cold draw was moderate—perhaps just a tad tight for my liking. The foot exhibits a cross-section of tightly packed tobaccos. Once lit, faint pre-light notes of sweet cedar and oak transition to a medium-bodied, leathery profile. Individual flavors include leather, molasses, earth, dry wood, and banana bread. After only a quarter of an inch, the draw opens nicely and the smoke production is ample, sweet, and aromatic. Towards the midway point, there is an increase in spice with tastes of cayenne and both white and black pepper. Leather is still the dominant force, however. The burn line is imperfect but not at all troublesome, and the white ash holds firmly off the foot. The final third can be characterized as medium- to full-bodied with additional bright citrus flavors. 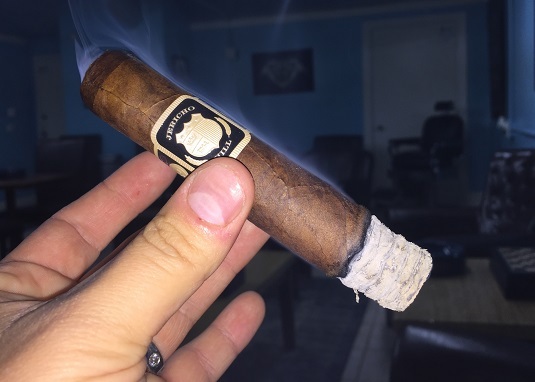 When it was introduced in 2014, Jericho Hill marked a departure in strategy for Crowned Heads. It was the first regular production cigar to be produced at a factory other than E.P. Carrillo’s La Alianza in the Dominican Republic, and it was also the first time the company employed a San Andrés wrapper. The result is a well-balanced, earthy, leathery, well-made cigar. The Jack Brown vitola earns an admirable rating of four stogies out of five.